Here are some ideas for your Holiday Wish Lists for those you love! Click here to download the slightly different interactive PowerPoint Show edition of this video. some computers might not render the audio and animations properly. 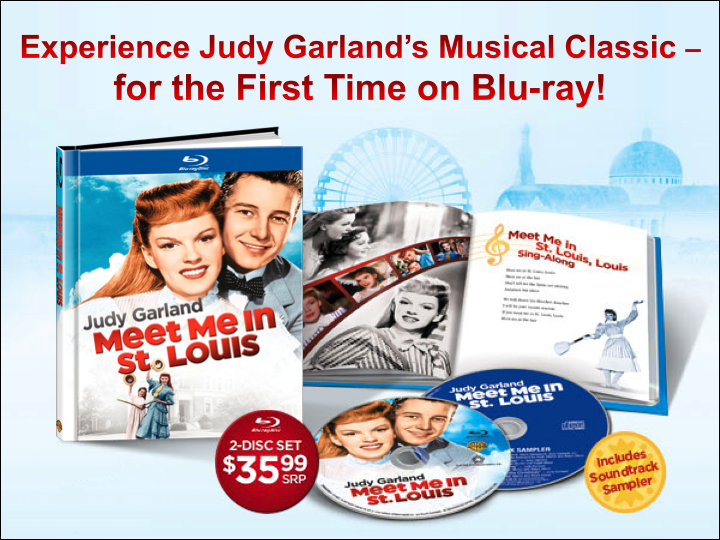 This MGM musical masterpiece is Judy’s first collaboration with future husband, director Vincente Minnelli. The 2-disc set features a new “digi-book” and a CD soundtrack sampler. If any film is perfect for Blu-ray (after The Wizard of Oz of course), this is it! Judy’s entire Decca catalog gets a new remastering in this deluxe 4-CD set. The tracks sound better than ever before, who know they could sound this great? Grab it while you can, in this online digital world this is probably the last time Judy’s Decca catalog will be released on CD. The folks at the Warner Archive are releasing these new-to-DVD titles in a special boxed set: Andy Hardy Meets Debutante; Life Begins for Andy Hardy; You’re Only Young Once; Judge Hardy and Son; Out West with the Hardys; Andy Hardy’s Private Secretary. The first two are the last two remaining Hardy films Judy appeared in to be released on DVD. More Judy & Mickey! 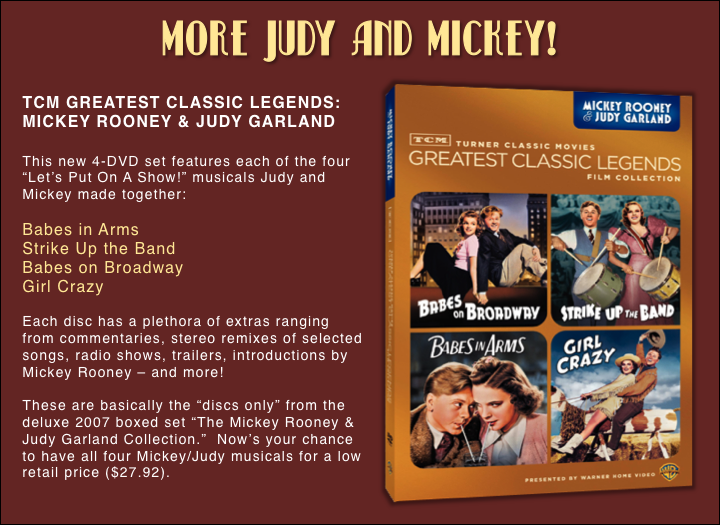 The discs previously released in the 2007 super boxed set are re-presented in this affordable presentation of the four “Let’s Put On A Show” musicals the duo made together. Both films are new to DVD, and are charming examples of the type of “small” films MGM made that seem like “big” films thanks to the talents involved. Prime examples of Judy’s talents as both singer and actress. John Fricke’s latest coffee table compilation is a visual feast! The highlights here are the previously unpublished photos wrapped up in a beautifully designed book featuring stellar graphics. 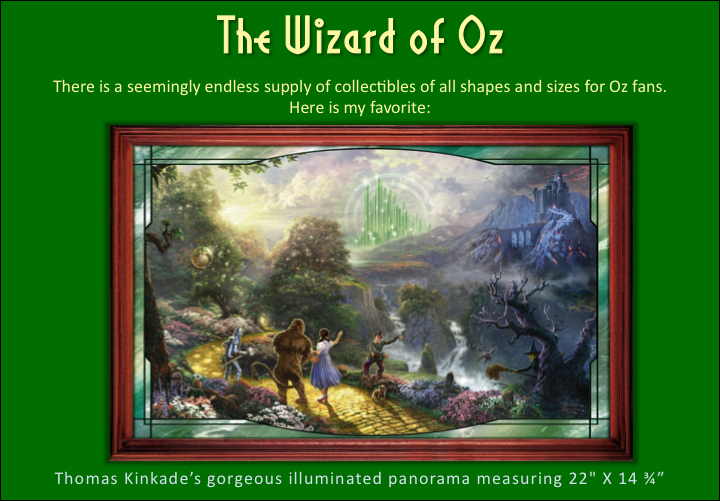 Each year, Oz fans are treated to a seemingly endless supply of collectibles. Thomas Kinkade’s gorgeous illuminated panorama is my personal favorite.